So a couple of months ago I discovered the frittata. Oh, and what a delicious discovery it was! 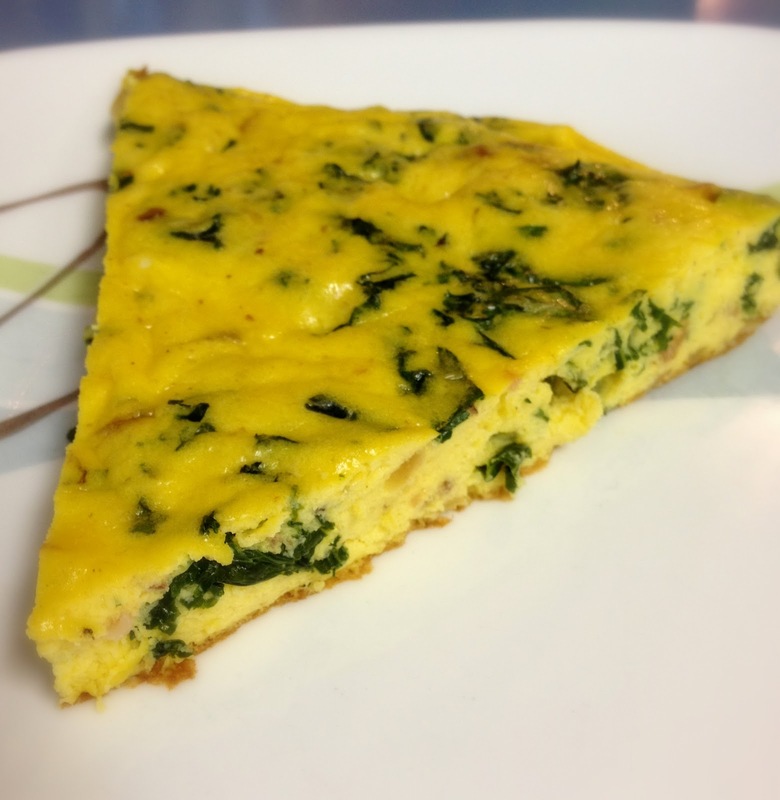 It also opened the door of my imagination to a whole world of possible frittatas. How easy would it be to swap out the asparagus for some other vegetable? The Gruyere for a different delectable cheese? Then I woke up one morning fantasizing about the combination of quality bacon with some sauteed kale (both of which happened to be hanging around in our fridge). Let me tell you, it was a winning idea. I mean really, how can you possibly err when you saute kale and onions in bacon fat? And toss in some unbelievably bright farm fresh eggs. And Tillamook cheddar. I mean, really. In a medium bowl, whisk together eggs, half & half, salt and pepper until combined. In a non-stick, oven safe skillet, cook bacon over medium heat until crisp. Remove and drain on paper towels. Reserve about 1 TB of bacon grease in pan. When drained, chop or crumble bacon and set aside. Add onions and saute 1-2 min. Add kale and continue sauteing until kale is wilted, about 3-4 min. Stir cheese and bacon into egg mixture. Pour egg mixture into the skillet with the onions and kale and cook, using a rubber spatula to stir and scrape the bottom. Large curds will begin to form after about 2 min. but the eggs should still be quite wet. Shake the skillet to distribute eggs evenly then allow to cook for 30 seconds without stirring- this will set the bottom. Transfer the skillet to the oven and bake about 10 min. 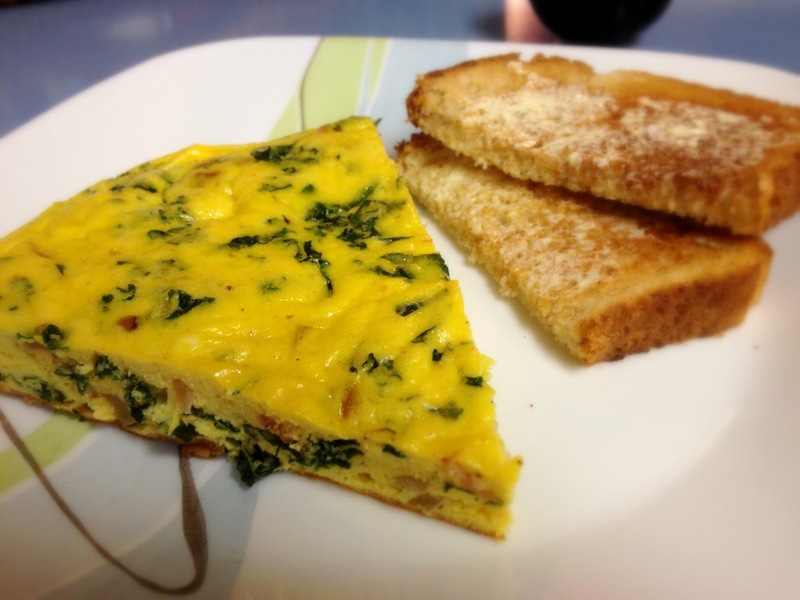 If the frittata is set but just slightly wet and runny when you cut into it, it is done. Remove from oven and let stand 5 min. Loosen edges with spatula, then slide it out of the pan, cut into wedges and serve.